Use TB2TTT4 to reference this item. In loving memory of Todie Phillips! Tod, 1/3 of Team Rod & Tod w/KAboom was tragically killed in a motorcycle accident when a motorist pulled into his lane unexpectedly. Tod (as we have surmised) likely locked his brakes and skidded sideways until he perceived he was safe to disengage the brake and resume. Unfortunately, when in a skid, bikes usually tend to skip if the brake is released (as I learned at the funeral services). Tod likely released the brake (just a speculation), the bike jumped and then grabbed before flipping several times...Tod rode it to the end! This accident was needless, the driver merely needed look and would have seen Tod there. This usally happens because of people being in a hurry. PLEASE take your time and help us arrive safely! 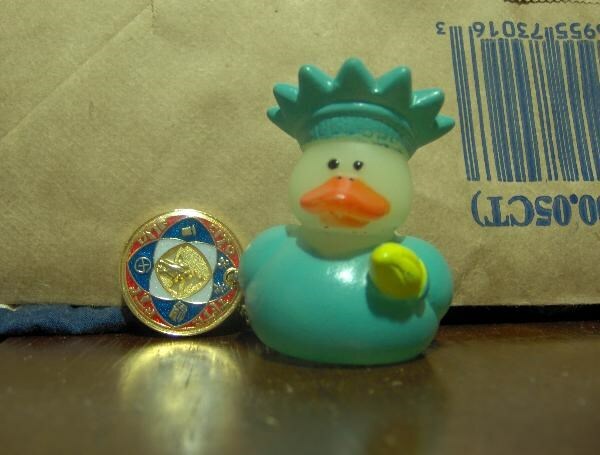 This is a coin with a item we attatched with them to start a journey in a race for Todie's Wild Ride, please do not keep these as we mentioned they are in a race and move them as quickly as you can to and from a cache. This is a race to help raise Bike Awareness all around the world. We had a dear friend that was killed in a Motorcycle accident and we are doing this in the rememberance of him and want people to drive more saftety when they see a bike on the road. Not in Old Abbey Mill cache today. I discovered this fine trackable when I went to drop off a trackable.